Prim and elegant, Sachiko has a rough side and a very sweet side. She is very protective over Yumi and cares deeply about her. However, Sachiko often has the same problem as Yumi does — she does not share most of her problems with her sœur, causing many misunderstandings. Sachiko is slated to marry her cousin and fiancé Suguru after she graduates. This has caused her some distress since, because although she initially cared deeply for him, he did not reciprocate. They now have a complicated relationship. Sometimes, Yumi must teach Sachiko how to live informally, for example, helping her select her first pair of jeans. Despite her sometimes stern appearance, Sachiko has her own share of insecurities regarding her relationship with Yumi, not to mention emotional insecurities rising from her home life; both her father and grandfather openly have mistresses, unabashedly dividing their time between home and the mistresses, which apparently led to her general disdain for men, as illustrated in the OVA series during a meeting with the student council members of Hanadera, an all-boys highschool. After Sachiko enters her third year, she is now the new Rosa Chinensis. After the arrival of Touko, Sachiko spends more time with her than with Yumi, which makes Yumi jealous. Sachiko goes absent from school which makes Yumi worried. Later, Youko is sent to "bring" Yumi to Sachiko's grandmother house. Yumi finds out that Sachiko's grandmother recently died, which causes Sachiko to go into depression. Sachiko says that she apologizes for the past few weeks, and asks for Yumi's forgiveness; Yumi says that she loves her very much. At the beginning of the summer holidays, Sachiko takes Yumi to her summer home. Whilst there, Sachiko's acquaintances make trouble for them. Yumi intends to leave, but Sachiko refuses. The acquaintances have a party, and invite them. At the party, they ask Yumi to play a musical instrument for Sachiko's great grandmother. Yumi says that she cannot play anything and prefers to sing the song "Maria-sama no Kokoro"; Sachiko accompanies her with a piano performance. The great grandmother is happy because the song brings back memories, and she asks Yumi to visit next year. In the first season, Sachiko is Rosa Chinensis en bouton, her grand soeur was Mizuno Youko, and her petite soeur is Fukuzawa Yumi. 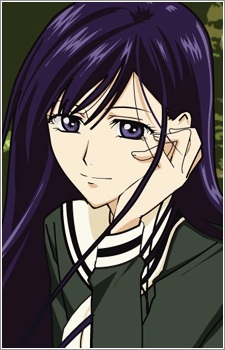 In the second season, Sachiko becomes Rosa Chinensis.